We've heard from everybody and their mother regarding the Redskins name lately, but not team owner Daniel Snyder, who has kept quiet on the subject since telling USA Today that he will NEVER change the name. So when I consider the Washington Redskins name, I think of what it stands for. I think of the Washington Redskins traditions and pride I want to share with my three children, just as my father shared with me -- and just as you have shared with your family and friends. We are Redskins Nation and we owe it to our fans and coaches and players, past andpresent, to preserve that heritage. We are glad to see that Mr. Snyder is listening to the growing number of critics on this issue that include the President of the United States, senior members of the U.S. Congress, civil rights organizations, public health organizations, and Native American tribes. These leaders and groups, who collectively represent millions of people, understand why a professional football team should not be promoting a racial slur. In his letter, Mr. Snyder made mention of his team's history. He opted to omit from his letter, however, that the original owner who gave the team its current name was an avowed segregationist. That suggests the team's name was deliberately designed to denigrate people of color. Unfortunately that ploy was successful. The marketing of this racial slur has had - and continues to have - very serious cultural, political, and public health consequences for my people and Native Americans everywhere. It is clear from Mr. Snyder's letter that he does not understand those consequences. So in the spirit of the dialogue that Mr. Snyder says he is willing to engage in, we are inviting him to join the NFL delegation in its upcoming meeting at our Homelands. 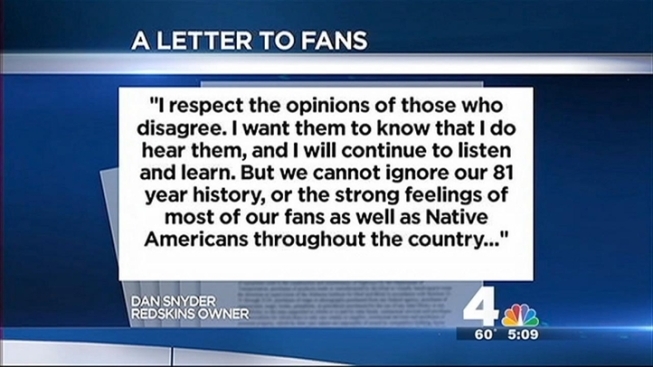 During his visit, we will organize a special meeting of Oneida Nation families where Mr. Snyder can personally explain to them why he believes they deserve to be called "redskins." He can then hear directly from them why that term is so painful.